With 50kg Half-bridge Experiments body Scale wholesale human scale load cell sensor resistance strain sensor, When measuring, the correct force is applied to the outer side of the strain E-shaped beam portion of the sensor (i.e., a strain gauge affixed to the middle, with a beam of white plastic cover arm) and the outside edges to form a shear force in the opposite direction, i.e., in the middle of strain beam bending necessary changes can occur under stress, strain beam side by another force cannot have a barrier. Internal 1000Ohm half-bridge strain gauge load cell, the range is 50kg, half-bridge structure. Widely used in hopper scales, platform scales, platform balance, belt scales, and other electronic weighing devices. This is a half-bridge load sensor, which is widely used in weight scales. 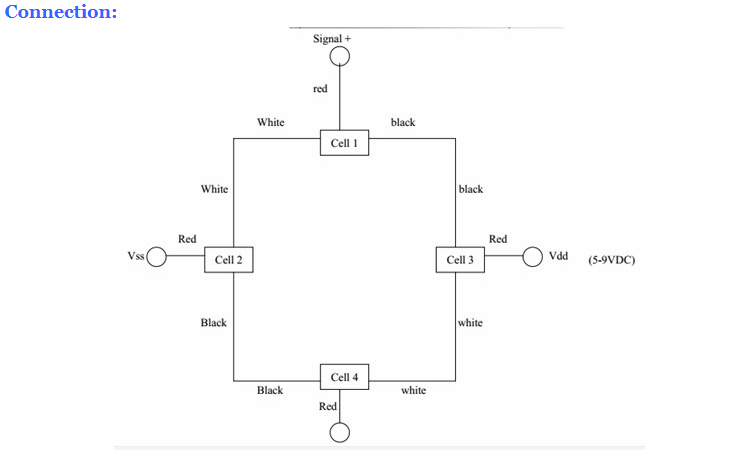 When the half-bridge is being stretched, it sends the signal via the red signal wire. Alloy Steel wired weighing load cell, high accuracy, simple structure, simple installation. You can use multiple load sensors simultaneously to increase the capacity range, Parallel use to add additional capacity.